This is a great white pique coat - this style of coats was very popular in the early 1970s. It has red top stitching and an attached gold belt in the front. The belt has a gold buckle. 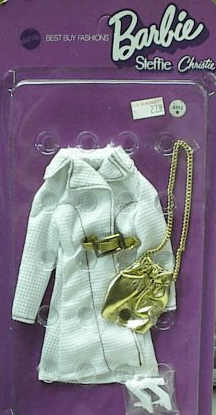 The large gold lame handbag has a gold chain strap. The coat is somewhat easy to find - but the white does tend to show dirt very easily. The bag can be hard to find - especially in great condition.